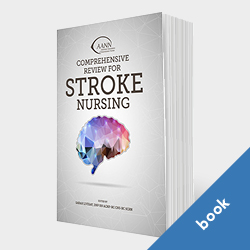 The AANN Comprehensive Review for Stroke Nursing is a comprehensive resource for nurses preparing for the Stroke Certified Registered Nurse (SCRN) exam and those looking for a review of current best practices for providing stroke care. This evidence-based book covers key topics listed on the SCRN exam blueprint, including anatomy and physiology, preventative care, hyperacute care, stroke diagnostics, acute care, medications, postacute care, and systems and quality care. The AANN Comprehensive Review for Stroke Nursing is also available in e-book format. Or, save money by purchasing the print and e-book bundle. This is a great book as a reference but I would not rely on it to pass the SCRN. Use it in conjunction with a review course, online or DVD. This book is pretty much an outline of titles without much explanation. Mentally and visually exhausting. This book was invaluable to me in passing the SCRN test. I personally liked the outline format and found it an easier way to learn a lot of complex information quickly. Other nurses I work with that studied this book also remarked how it helped them pass the SCRN and we all recommend this book to other nurses looking to pursue this certification. The book is very thorough but very difficult to read. It offers no visuals (which would be particularly helpful in the anatomy portion) and is not helpful to anyone that is not a read/write learner. The book had great content, but I was disappointed in the structure. I wouldn't recommend this version to many people. I felt you need several books in order to study for the SCRN exam. The book is good for organization from pre-hospital to rehab. However, I am a visual learner also and I wrote my own notes and study also the CNRN book for assessment. Please study the circle of willis and understand what goes on based on the stroke. This helped me. I love this book. It has been an excellent resource for me as a neurosurgical ICU nurse. It has also been a great reference for training new nurses on our unit and other stroke units at our hospital. I need to purchase a new one because I loaned mine out and that person did not take good care of it. I also used this book for review prior to the exam but the outline format was tedious and sometimes hard to keep my interest. I am mentoring other staff who also felt another book "Fast facts for Stroke Nursing" was an easier read along with the book above. I don't like "outline format" books. I prefer to read the text and make my own outline for review for exams. So far, it does seem to be comprehensive, but I'm a visual learner, and it just doesn't work for me. This is an excellent source to use to study for the SCRN test. It provides information on the topics that are tested on the SCRN test. Great to give away as a chapter prize or gift.